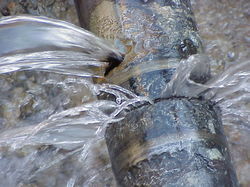 Control, Automate and Monitor your homes water supply to avoid the worst kind of damage. This has got to be every home owners worst nightmare. The water line to the clothes washer breaks flooding the home and damaging everything in it. This kit contains everything you need to monitor any leaks and control, automate and monitor the water flow into your home. Imagine coming home and seeing that the control system turned off the water after it sensed a water leak. All of these kits include a Vera Edge Home Controller. This controller is easily expandable to control your entire home and as always require NO monthly fees.